Haflong : Observing 137th Martyrs’ Day of Veer Sengya Sambudhan Phonglo, hundreds of people from various communities of Haflong paid homage to the Dimasa National Freedom Fighter of India at Haflong today. The day’s programme started with Mass Gathering at the Statue of Veer Sengya Sambudhan Phonglo, garlanding, followed by speech by senior citizens. Speaking on the occasion speakers like Sukhen Phonglo, Dethang Naiding, Liton Chakraborty, Anil Daolagupu Surjya Thaosen, Anup Biswas etc recalled the contribution of the martyr and appealed to follow the foot prints of the Veer Sambudhan who have contributed a lot for the people. 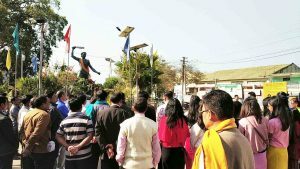 The Dimasa Students’ Union (DSU) in collaboration with the Jadikhe Naisho Hosom has organised the observance of 137th Martyrs Day at Haflong on Tuesday. At Gunjung also the Dimasa Youth Forum (DYF) in collaboration of youths of Gunjung organised the observance of 137th Martyrs Day of Veer Sengya Sambudhan Phonglo where he fought against the British. The day’s programme started with the paying of homage to the martyr’s portrait by Chief Guest, Nobojit Hojai, MAC, Guest of Honour Nandita Gorlosa, MAC and other prominent persons of Gunjung. This was followed by a meeting where in Nobojit Hojai, MAC, attended as the Chief Guest and Nandita Gorlosa, MAC, as Guest of Honour along with many dignitaries. All the speakers stressed on the importance of observance of the day related to the martyrdom of such great leader who has fought for the betterment of this place.